At right is a sign spotted days ago at a closed Borders in Chicago. There are a lot of fourth-grade-level bathroom jokes I could make, but I won’t. I will agree, though, the sign makes a good argument for the brick-and-mortar bookstores. In other publishing news, Barnes & Noble is recruiting app developers for its Android-based NOOK Color Reader Tablet. 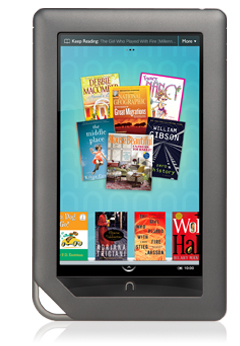 For more information, check out the NOOK Developer blog or register as a developer. This news comes on the heels of the late-March frenzy inspired the April update for NOOK. And that concludes my reporting on eBooks today because my portfolio needs polishing and I have an e-commerce project I need to wrap up. Photo via e-reads and e-BookNewser. Categories: Android, Books, business, ecommerce, education, etextbooks, marketing, mobility, mobility, NOOK Color, tablets, tech, trends | Tags: Android, business, e-commerce, ecommerce, education, NOOK, Nook Color, technology, textbooks, trends | Permalink. The Wall Street Journal and New York Times reported that textbook publishers McGraw-Hill and Pearson have invested in Inkling, the San Francisco-based e-textbook developer. Inkling declined to disclose the specific amounts McGraw-Hill and Pearson invested or the total funding it has raised so far. The start-up’s current investors– Sequoia Capital, Felicis Ventures, Kapor Capital, and Sherpalo Ventures–also took part in the financing. EARLIER: A roundup of e-textbook developments and forecasts, and a student’s two cents on the shift in the industry. Categories: business, ecommerce, education, iPad, iPad2, mobility, mobility, tablets, tech, technology, trends | Tags: business, e-commerce, e-textbooks, education, etextbooks, marketing, mcgraw-hill, mobility, pearson, publishing, tablets, tech, technology, textbooks, trends | Permalink. In response to visitors’ interest in The Wall Street Journal story on e-textbooks, I’m now covering textbook publishers’ response to industry demands. As a marketing student who spent a child’s ransom on textbooks this semester, and the semesters before that, I understand the need to find a lower-cost alternative to traditional textbooks. And although I’m tablet enthusiast who is always eager to see what added value emerges as the technology becomes more sophisticated, I’m a compulsive highlighter, note-scribbler and paper-clipper, all of which makes me feel like I learn more. So it’s likely I’ll be slower to adopt e-textbooks. I doubt I’m the only student who feels this way about textbooks, but as the industry shifts, students’ purchasing habits will have to change. In the spring issue of College Services magazine, Jade Roth, of Barnes & Noble College Booksellers, discusses the slowth growth of the e-textbook market — which she attributes to technological and content limitations — and the surge in purchases last year. Roth reports B&N campus bookstores enjoyed a 3000% increase in e-textbook sales last year — the same year 14% of students reported buying an e-textbook. Roth cites e-readers’ improved functionality and integration among the reasons more students — and faculty — are turning to e-texts. What’s not mentioned — and I understand why; the author works for B&N — is the 900-pound industry disrupter: the release of the iPad last April. Suddenly the world was introduced to a slick and pretty tablet from a company that can do no wrong. Apple’s halo is super shiny, and it’s understandable that more people — including students, despite iPad’s price tag — would flock to a tablet computer. And if we couldn’t afford an iPad, maybe we went with a NookStudy or a Kindle as e-reader sales doubled in 2010. Meanwhile, Reuters tells us that the Association of American Publishers reports January e-book sales (not just e-textbooks) jumped to $69.9 million compared with $32.4 million in January 2010 — 115% increase. Reuters reports adult hardcover and paperback sales dropped in January, but sales in the higher-education category, which includes college textbooks, were down only a bit: $382 million from $387.6 million in 2010 — perhaps further proof that the skyrocketing e-textbook market is far from maturity. RELATED: This just in: The Associated Press is reporting Borders is closing an additional 28 stores. Categories: advertising, Books, business, ecommerce, education, iPad, iPad2, marketing, Media, mobility, mobility, social media, tablets, tech | Tags: business, e-commerce, e-textbooks, ecommerce, education, etextbooks, iPad, iPad2, marketing, media, mobility, publishing, tablets, textbooks, trends, Xoom | Permalink. The Wall Street Journal reports publishing powerhouses McGraw-Hill (NYSE: MHP) and Pearson PLC (NYSE: PSO) are working with an interactive textbook startup to offer more higher-education titles on tablets. 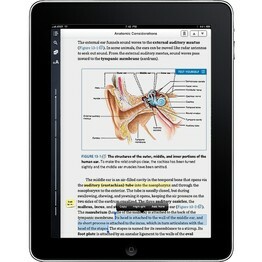 Pearson is in “advanced discussions” with app-maker Inkling, while McGraw-Hill has already signed an agreement. McGraw-Hill said its top 100 undergraduate titles and its medical-school curriculum would be converted to a digital form with interactive features over the next year. Vineet Madan, vice president of McGraw-Hill’s higher education division, called the move “just a first phase” in its plan to create more engaging learning experiences. Considering how hard I am on textbooks, I’m not sure I welcome the move to e-textbooks — despite being a tablet enthusiast. I need to highlight, draw arrows, paper clip, paper clip some more, and use Post-it notes on every other page. Also, it’s doubtful my tablets would recover very well from spilled coffee/Red Bull/Diet Pepsi, etc. Categories: Books, business, ecommerce, education, iPad, marketing, mobility, Motorola, tablets, tech, Xoom | Tags: books, business, ecommerce, education, iPad, mobility, publishing, tablets, tech, textbooks, Xoom | Permalink.